Experts believe that the recent wet weather in the UK could be to blame for a giant sinkhole opening up in Hemel Hempstead in Hertfordshire. The 35ft-wide sinkhole opened up at around 6am on Saturday morning, leading to dozens of houses being evacuated as a safety measure from a street in Hemel Hempstead, Hertfordshire. The area, as well as surrounding roads, has been closed. Local police evacuated 17 homes in Oatridge Gardens, Hemel Hempstead, as residents reported feeling earth movement during the night. Gas and electricity are being cut off as a further precautionary measure. 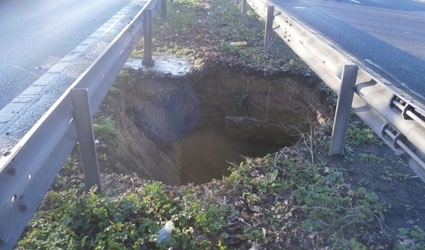 This latest incident is the third in a week, on Wednesday a 15ft-deep sinkhole opened up on the M2 motorway, and another, measuring 30 feet, opened up in High Wycombe, taking a car with it earlier this month. 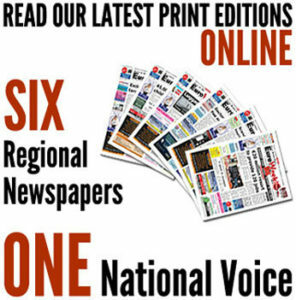 At least 140,000 homes were initially without power following gale force winds of up to 80mph, and two people have lost their lives. One woman was killed as a building fell on her car in London on Friday night. Her two passengers were taken to hospital. A passenger was killed after a freak wave hit a cruise liner in the English Channel. The weather is causing yet more travel chaos, causing disruption on rail routes, including Southeastern, South West Trains and Southern. The weather is expected to ease during Saturday afternoon; however the Met Office has issued yellow warnings for heavy wind and rain in place across much of England and Wales.